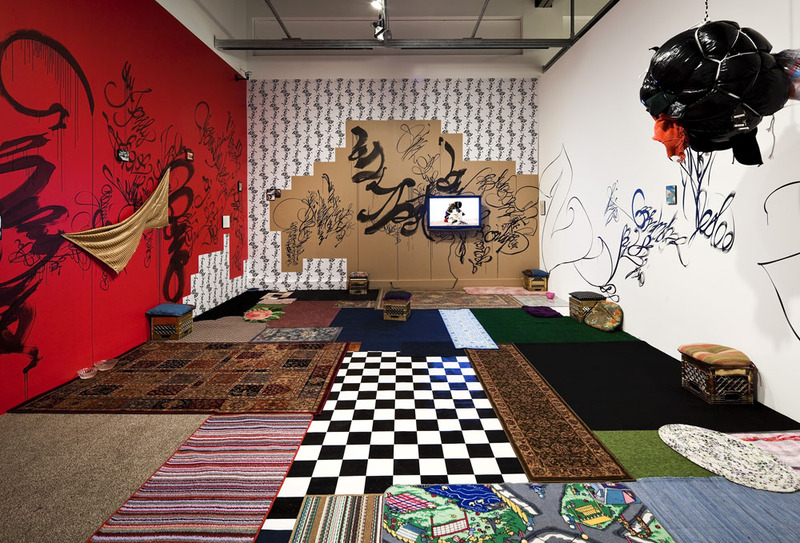 The Museum of Contemporary Art (MOCA) will present Shinique Smith’s first large-scale U.S. museum exhibition from September 16 – November 19, 2010. In this exhibition, Smith will use MOCA’s flexible gallery space to explore new ways of working and installing her work. Part of MOCA’s Knight Exhibition Series, Shinique Smith: Menagerie will include installations, works on paper, and video from 2002 to the present. Shinique Smith: Menagerie is organized by the Museum of Contemporary Art, North Miami in association with Madison Museum of Contemporary Art and is curated by MOCA, North Miami Executive Director and Chief Curator Bonnie Clearwater. The exhibition will also be on view at Madison Museum of Contemporary Art, Madison, WI from January 22 – May 8, 2011. Since bursting onto the scene in 2002, this young New York-based artist has produced works that combine complex social and cultural references with a broad array of art historical sources, including Abstract Expressionism, colorfield painting, minimal sculpture and Japanese calligraphy. Her sculpture and installations are composed of collections and accumulations of found objects and second-hand clothing, which she ties together to form minimal cubes or wraps into bulbous bundles. Urban life is suggested both in her sculptures as well as the graffiti-like gestures of her exuberant paintings. Viewing line as the element that “holds” everything together in her work, Smith will weave a line both physically and figuratively throughout the space of the exhibition. An installation created from cloths, string and ribbons at the entrance of the space will form a draping canopy that gradually shifts into ribbon and string toward the gallery’s center, where visitors can explore two earlier installations—No dust, no stain, 2006, and Twilight’s Compendium, 2009—that have been recreated for this exhibition. Menagerie is an apt title for this assortment of paintings, drawings, videos, and three-dimensional work Smith has assembled to satisfy her own curiosity at this juncture of her career. “Individually,” observes Bonnie Clearwater, “they are vibrant and exuberant organisms that Smith masterfully tamed. Each of these works tells the progress of Smith’s hand; each piece is essential to her story.” Hardly any of these works have been shown together before and most now reside in collections far and wide. Although the selection represents a variety of family types—bales, totems, reclining figures, and calligraphic gesture—the juxtaposition emphasizes each work’s individuality and personality. Shinique Smith was born in 1971 in Baltimore, Maryland and lives and works in Brooklyn, New York. She received her BFA and MFA degrees from The Maryland Institute College of Art, and MAT from Tufts University & The School of the Museum of Fine Arts. An illustrated catalogue co-published by the Museum of Contemporary Art, North Miami and Madison Museum of Contemporary Art will accompany the exhibition featuring essays by essays by Bonnie Clearwater, Executive Director and Chief Curator of the Museum of Contemporary Art, Jane Simon, Madison Museum of Contemporary Art Curator of Exhibitions and Paul D. Miller (aka DJ Spooky). Shinique Smith: Menagerie is made possible by the MOCA Knight Exhibition Endowment, Francie Bishop Good and David Horvitz, and Funding Arts Network.